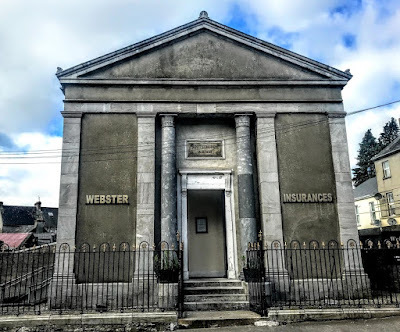 The former Presbyterian Church or Scots Church on the corner of James Street and John Street in Tipperary Town is an interesting conversion to modern offices by Webster Insurances that respects that past but that looks forward to the future. 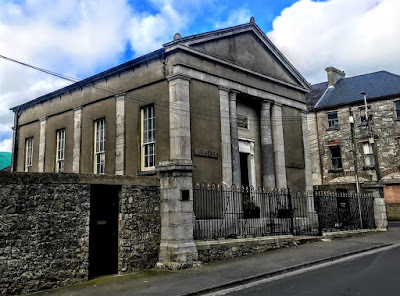 This building, facing onto James Street, was designed by a leading Co Tipperary architect, William Tinsley (1804-1885) of Clonmel, Co Tipperary. William Tinsley was born in Clonmel on 7 February 1804, a younger son of Thomas Tinsley, builder, by his wife Lucy (Brough). He was about 16 when he began working in the family building firm, which was time being run by his eldest brother, John Tinsley. In the evenings, he attended classes in mathematics at the Clonmel Endowed School. Although Tinsley was baptised into the Church of Ireland, he joined the Methodists before he was 21 and remained a committed Methodist for the rest of his life. When his brother John died in November 1825, William took over running the firm, but he returned to the Clonmel Endowed School to study painting and drawing. Over the next 20 years, he built up a substantial practice as a builder and architect in the neighbouring counties of Tipperary, Waterford and Cork, and his client list included the Marquess of Waterford at Curraghmore and the Earl of Glengall at Cahir. From the mid-1840s, he gave up the building side of the business and practised solely as an architect. When the Ecclesiastical Commission in the Church of Ireland was reorganised in 1843, Tinsley was appointed architect to the Diocese of Lismore, in succession to James Pain. He had already built several churches to Pain’s designs, had sought Pain’s advice, and when his fourth son was born in 1844, he was named James Pain Tinsley. Tinsley was a member of the jury in the trial of William Smith O’Brien in Clonmel in 1848. By then, the Great Famine had led to a decline in business, although Tinsley’s circumstances remained more than adequate. But, in a prevailing climate of economic uncertainty, he was anxious about the prospects of his large family, particularly his seven sons. His first wife Ellen (MacCarthy) had died of tuberculosis after two years of marriage. He then married her cousin Lucy MacCarthy. William and Lucy Tinsley and nine of their children, ranging in age from 19 to less than a year, sailed from Waterford to Liverpool in September 1851, and on to New York. The family settled in Cincinnati, where he built a successful career in the mid-West. He won the competition for North Western Christian University in 1852-1853, and this led to further commissions for substantial college buildings, including the Institution for the Education of the Blind at Columbus, Ohio. Meanwhile, Lucy Tinsley died in Indianapolis in 1857. William’s third marriage, to Mary Eliza Nixon, ended in estrangement. In all, he was the father 17 children with his three wives. He died in Cincinnati on 14 June 1885 at the age of 81 and was buried at Crown Hill Cemetery, Indianapolis, with his second wife Lucy. Tinsley’s Presbyterian church in Tipperary is a small version of the similar Wesleyan chapel he designed in his town of Clonmel. It was built in 1843-1844 on a corner site leased from the Smith-Barry estate which owned much of the land in this part of the town. The builder was James Keyes Fahie (1809-1899), who built a number of important buildings in the town, including the National School and the Court House on Saint Michael’s Street and the Railway Station. Fahie studied architecture at the Royal Dublin Society’s School of Drawing in Architecture. After working in Tipperary in the 1830s and 1840s, he too moved to the US in the 1850s, following his brother Arthur who had already emigrated. Fahie eventually returned to Ireland and settled in Dublin, where he joined his second son, James Angelo Fahie, in practice as James K Fahie and Son, based at 23 Leinster Square, Rathmines, and later at 2 Nassau Street. Fahie died in Dublin in 1899. The church was built in the form of a freestanding classical Greek temple. It stands on a prominent corner site, with good stone piers and decorative iron railings surrounding the site. The rendering of the main walls highlights the quality and diversity of the stonework of the pilasters and other features and details. The symmetrical proportions are eye-catching and it looks like an intimate building that once served a small but confident community. The single-storey building has four-bay side elevations, a pitched roof, a pediment with moulded limestone cornices, a rendered tympanum and frieze, and an acroterion on the east gable that enhances the classical appearance, moulded capitals and bases, rendered walls with cut limestone pilasters at all sides and between the windows, and a coursed dressed limestone plinth. The recessed entrance bay at the front is flanked by stone columns with stylised leaf capitals. It has a date plaque reading ‘Scots Church AD 1844.’ The square-headed entrance has a painted rendered doorcase, with a moulded canopy supported on fluted brackets, plinth blocks and a timber panelled double-leaf door approached by a flight of limestone steps. There are wrought and cast-iron railings and gate on a moulded limestone plinth, with dressed limestone piers that have carved limestone caps. 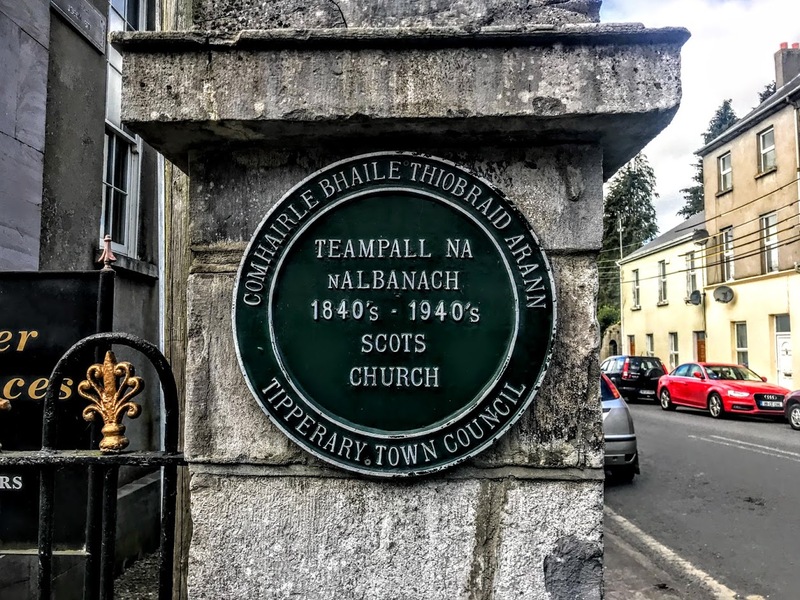 Records show that in the 1840s the Presbyterian congregation in Tipperary was about 30 to 40 people. The numbers varied over the years, but by the early 1940s numbers had fallen considerably, and services were held only occasionally. The building was leased to the Church of Ireland parish of Saint Mary’s in 1946, and it was used as a school, a church hall, and a parish hall. Ownership eventually passed to the Church of Ireland, and the building continued to be used as a school into the 1980s. An extension was added at the rear, to provide toilets and other modern conveniences. 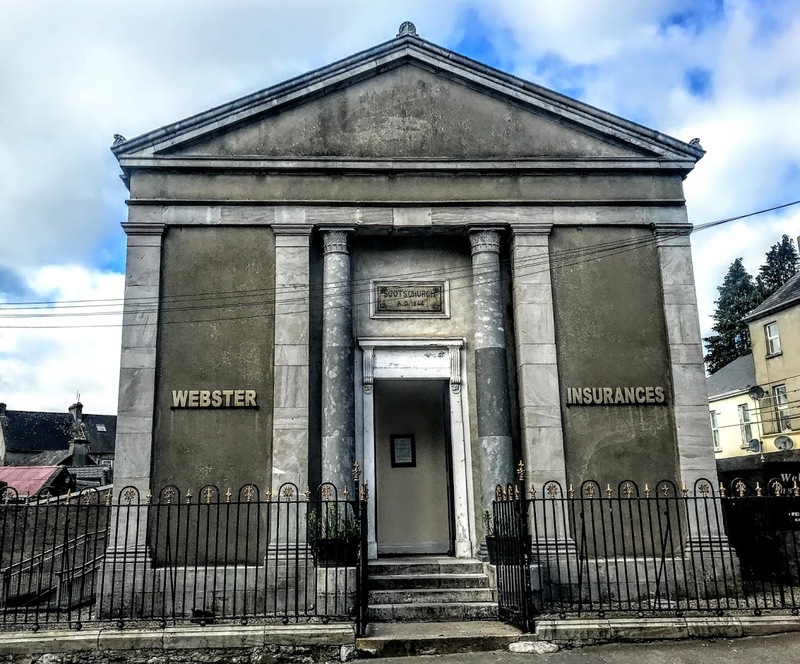 By the time the building was bought in 2003 by Declan and Elljay Webster of Webster Insurances it had fallen into a grave state of disrepair, the roof was leaking, and the windows had failed. The Websters wanted to convert the former church into modern office accommodation and commissioned the architect Robert Cummins of Golden to design a solution. The work carried out by local contractor Billy Whelan of Tipperary along sustainable architectural conservation principles. This work includes a mezzanine floor in the main hall that incorporates all the main modern services, including electrics, networking and air conditioning. This structure, along with all the modern insertions, are bolted together, but this means they can be easily removed to allow the building to return to its former layout in the future should circumstances change.